Each member of the hair styling team has been meticulously chosen and thoroughly trained to represent and maintain the integrity of the Studio 285 Salon brand. With great pride, we present you the best the industry has to offer. Brittany Harrington was born and raised in the city of Augusta, Ga. Knowing from a young age that her calling in life was to serve the needs of others; she vivaciously tailored her destiny into the craft of cosmetology. At the age of 14 Brittany began to work for one of the city’s most sought after stylists as a personal assistant and just three short years later began to apprentice under her. During her apprenticeship she also attended the Georgia Institute of Cosmetology where she fine-tuned her skill sets. Not long after graduation, Brittany took a leap of faith and opened her first salon back in 2004. Her business quickly came into fruition and blessed her with three wildly successful years. It was in this experience that inspired Brittany to seek an even bigger dream and take a chance on the now established Studio 285. The city has congratulated Brittany on her and her team’s first class services by awarding her with the Metro’s Best Hairstylist award in 2010, along with the Best and Friendliest Staff award. In 2011 Brittany began to develop a partnership with celebrity hairstylist Kim Vo and became the only Kim Vo pure salon in the southeast. This pairing quickly developed into a lifelong friendship where she went on to shadow under him and learned all of his coloring techniques. She continues to work with Kim Vo closely to maintain a standard of service that is above and beyond most competitors. Always feeling the need to grow her and her team’s skills and services, in 2012 she attended the "On Set Hair Academy" in Santa Monica Ca. and was taught one on one by celebrity hair stylist Susan Lipson. Amber graduated from Augusta State University with a BA in Sociology and a minor in Business. After 2 years in the corporate world, she decided it wasn't for her and went back to school to get her Masters in Nursing. For 7 years she worked as a M.A in Urology. While pursuing her medical career, her younger sister Brittany was always begging her to quit her nursing job and come manage Studio 285. So as fate would have it, in 2012 Amber's husband Dennis was furthering his education and they decided that she would be the one to take a break from the school thing, and work at the salon while he finished his Master's and Specialist degrees in Education. During this time, she found that although she loved the medical field, she really fell in love with managing and growing their business more. On top of managing the day to day operations at Studio 285, she also does the airbrush tanning! Dalton Harnage is the youngest and newest addition to the Studio 285 team and is also a recent graduate of Grovetown High School. At a very young age Dalton realized his love for the arts and expressed that love by dancing and performing in multiple theater companies. While finding his passion in the arts he was also fortunate enough to find another love in life--HAIR. Dalton loves the styling process and he does an amazing job at putting the finishing touches on any look. He may be young but his smile lights up the room and you can really see his passion for making each and every client feel like a million bucks. Dalton is enthusiastic and excited about his career here at Studio 285 and is currently assisting Brittany as he learns and perfects his skills. Whitney Walker recently received her cosmetology license and is now licensed in both Georgia and South Carolina. 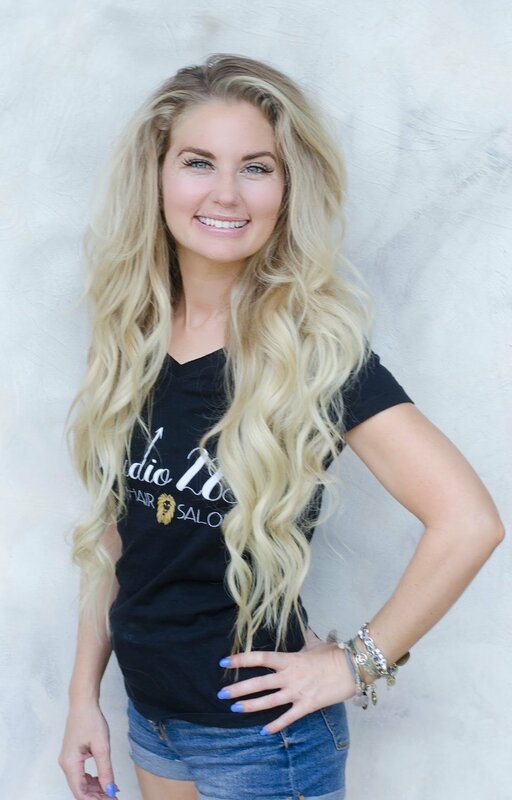 She specializes in extensions and Balayage but has mastered every technique you can think of. Brittany Harrington handpicked her for the position and before completing her license, she worked as Brittany's assistant stylist for over a year. Taking in what she learned over the years, Whitney has solidified her position in Studio 285's team of stylists. When you choose to sit in Whitney's chair, you will not leave Studio 285's doors without feeling like your ready for the red carpet. We wouldn't be the best Salon in Evans, GA without our supporting staff.